We figured out a way to sell the wristbands online. If you click the “Get The Gear” tab on our facebook fanpage you can purchase them right on fbook via paypal. 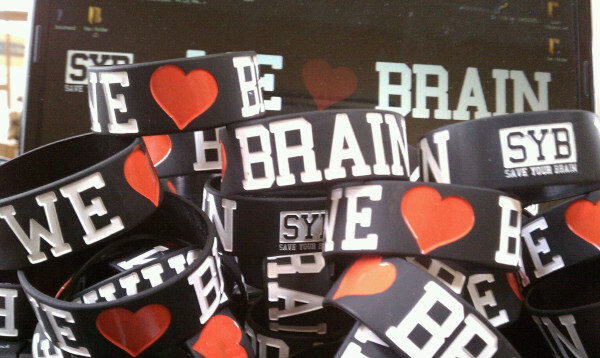 If you “like” the fanpage and store you get $1 off each wristband. Go there and get yours. Also a reminder to those in the Illinois/Midwest I have some for purchase as well, let me know via email. I have been sporting mine, get yours!!! (Project Brain Wave) High school football is one of the most exciting, defining, and proud markers of American culture, and is a level of play that to many, extends beyond being just a game. The dreaded months of training camp, the long hours in the weight room and practice field, and the time spent studying playbooks to perfect a team’s system all contribute to the same goal—that being the unforgettable feeling of standing beneath the lights on a Friday night before your home crowd, set to take on the opponent you have prepared for. This feeling that empowers our student athletes, that makes our parents proud and supportive, that makes our friends anxious to witness game day, is what the coaches and players live for. High school football is defining, and is home to life lessons to be learned and experiences to cherish. But for the Fernandez family, the high school football season of 2008 is one they will never forget. But such a mentality would soon be combated during one of his freshman football games, as Drew received the ball at running back during play, and then took hits from defenders in both the front and back of his head while he was being tackled. Drew had sustained a concussion, and would be removed from play. His mother told me of what events would then follow after her son took a blow to the head, resulting in his diagnosis. The words of a worried standing beside her son unsure of the future of her fourteen-year old child are powerfully unsettling to say the least. For Sue DiTullio, August 8, 2007 will be a day she will never forget—a day where she could have lost her son, Greg. Greg sustained a concussion during his football practice following a helmet-to-helmet hit during a basic tackling drill. After the hit, he approached his coach and told him that he had a bad headache, which came to result in Greg dropping to a knee, vomiting, and then passing out on the field. Within minutes, an EMT unit was on-site and found what would be described to be a “very weak pulse.” To the shock of all bystanders, the hit was more than what one would consider to be a typical collision in a youth football environment—it was a decisive blow that caused a subdural hematoma, which is a collection of blood that forms upon the surface of the brain. In the hospital, Greg’s parents arrived to a room filled with hospital attendants surrounding their child pinching him, slapping him on the chest, and yelling at him to try and get the slightest response—a method that was used for the next ninety-six hours while the medical staff monitored him. It was found that Greg sustained a severe midline shift in his brain that was nearly a 1.2-centimeter misalignment, which caused massive bleeding on the right side of his cortex. Doctors from the neurosurgical team were clear to insist that his craniotomy procedure was to be performed immediately. Greg would be later declared the stability to survive this heart-wrenching incident, ultimately marking the beginning of a life that would be significantly altered with regards to his physical and cognitive capacity. That moment, to the understanding of the DiTullio family, was the day in which they nearly could have lost their son. The DiTullio family rather sees it as the moment in which God let him live, for they never gave up on the hopes of Greg’s recovery. To the DiTullio family, life has come to be a continuous altercation against struggles in health for Greg. They know that Greg’s life will never be the same, but their true optimism and love for their son gives them motivation to take on each challenge and make every day better. From the moment in which Greg emerged from the hospital as a survivor of sport-related head trauma, his family has put forth an effort in setting goals to make his remarkable recovery mean something. There are days in which they feel that everything has fallen out of their control, but such days are complimented by ones in which they feel that their efforts and prayers are making a difference in their son’s life. Ever since the incident of Greg’s injury, the DiTullio family has been provided a handful of theories that try to explain what caused his concussions to become so severe. This included the questioning of whether or not the helmet was too old, or if the padding was too old and too stiff to absorb the force of the hit, or if he had been significantly dehydrated, causing fluids in the brain to be low, increasing the risk for contrecoup injury. Some say that this may have just been ‘bad luck.’ As much as the questions arose, the DiTullio family received little to no answers. All that they understood was that after this seemingly mild hit, their son found himself soon fighting for his life. The impact of Greg’s story has affected his community in a unique way. One year after his injury, his high school replaced their helmets at every level, and soon found decreased concussion rates in their football programs. In addition, this situation was powerful enough to launch what would come to be known as Families Against Brain Injury, a non-profit organization located in Ohio, headed by Sue, that aims to share Greg’s story while campaigning for greater awareness of sport-related head injuries. They also support the Outpatient Neurorehabilitation team of the Cincinnati Children’s Hospital—a dedicated group of therapists and specialists who work with children who are suffering from traumatic brain injury. Through progress has been a common theme in the steps of recovery for Greg, he seems to have fallen into another rough spot. Changes in medication, along with coping with the social effects that his injury has left him with, have debilitated his patience, as he finds himself struggling to move forward with his individuality. He is battling headaches, visual difficulties, pituitary dysfunction, endurance issues, and has developed a sleep disorder (post-traumatic hypersomnia/narcolepsy). From a cognitive perspective, Greg has shown significant improvement, though he has shown spells of issues with memory and attention. When Greg’s coaches were questioned why they did not evaluate him for a head injury when he first complained of a headache he described to be like no other that he had before, one replied saying: “it was a mild hit.” The others were unaware that there was even a helmet-to-helmet hit because Greg was not working in their group at practice. The first to really pick up on an issue was one of Greg’s teammates, who noticed him walking around at one point, and when he caught up with him, Greg seemed confused. The story of Greg DiTullio is one that should be heard by all involved in contact sports, specifically in all youth football programs. It is unreal how precious our very lives are, for at any moment they could be catastrophically misdirected toward a path of uncertainty. Like many other tragic stories that have been heard throughout the realm of athletics, Greg’s must be placed upon a platform, alongside many others, to represent that we all must think twice about our decision-making and recognize that the implications of sport-related head trauma are no joke.